Views, Views, and more Views! Bear Vista is located up on Mt. Crested Butte and takes in fabulous open views up the valley to Meridian Lake. Sit up high on the wonderful outdoor deck and watch the occasional bear that makes this valley home in the distance. This home is perfectly suited for your next family vacation with 2 living areas, 5 bedrooms and 3 bathrooms, all the while sleeping up to 10 friends and family! Located on Paradise Road where the evenings are quiet and the views are spectacular. Stand outside the home and the free shuttle will even stop to pick you up or drop you off at the end of the day, now that's convenient! Step inside this great family home after a long day of activities in Crested Butte, kick your shoes off, and sink into the living room with floor to ceiling windows all positioned to take in the fabulous views. On the main level there is the great room with the fully remodeled granite and stainless kitchen with custom cabinetry, the living and the dining room. There is a great wood burning stove and access to the large outdoor deck for that perfect cup of morning coffee or that end of day time with friends. Also on this level is a full bath and two bedrooms each with a queen bed and luxurious mattresses and bedding. Take a jaunt up stairs to the master retreat. The master bedroom has a fantastic King bed with vaulted ceilings and a gorgeous antler chandelier. There's even a cozy reading nook next to the bed. There is a master bath just outside the door to the bedroom and the loft area which overlooks the great room has a desk should you need to do any work on vacation (we hope not), and a small sofa with TV. The bottom level of the home is perfect for the kids and couldn't be more fun. There is a fantastic living area with large flat panel TV, a great game table, and a ping pong table for a friendly game to see who's the best. There is a full bath on this level and two bedrooms. One bedroom has a queen bed and the other has two sets of twin bunks. You'll love the location of this cabin regardless of the season and will definitely want to book it year after year for those great family memories! This house was great for our group of 10, beautiful views and close to the resort and town, we loved it! We stayed for a week over Spring Break and the house was exactly what we'd hoped for. We had two families total (4 adults and 7 kids ranging in age between 14 to 6 years old). The house fit us all perfectly. The views off the back deck were amazing and we saw many fox and dog sledders. The house was well stocked and had everything we needed. Additionally, the fact that the shuttle passes right in front of the house and dropped off and picked up at our mailbox was a plus. With 11 people that made it very convenient to get to the base of the mountain. 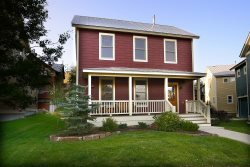 We will definitely come back to Crested Butte and would rent this house again for sure. Maximum of 3 cars on property. Property has oversized driveway for 2 vehicles, if parking 3 vehicles they will need to be smaller. All cars must be parked in driveway. No street parking.